Yum! This fun Thanksgiving or Christmas speech therapy game is piled high with holiday food vocabulary. 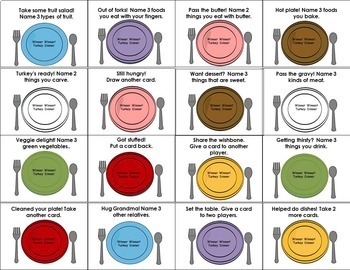 Answer analogy, synonym, or antonym cards, then draw a dinner plate. You may get a category question (Can you name three foods that are sweet?) or a plateful of yummy food. See who will collect the entire turkey dinner first! Winner, Winner Turkey Dinner! ✔An ink-saving low color version is also included for you, or you may print in grayscale. 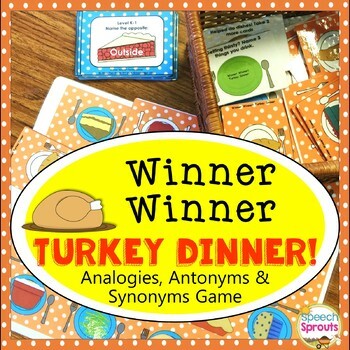 Winner Winner Turkey Dinner Game is terrific for speech therapy, small classroom groups or RTi. 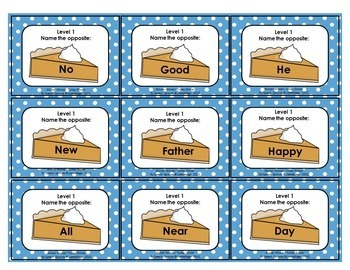 The leveled cards are appropriate for first through fourth grade. Open-ended versatility! Use this cute game with the 238 included cards or with your own to target any skill. ➤SKILLS TARGETED: Build Expressive and Receptive Vocabulary and Language Skills. •	48 Food Dinner Plate Cards- Collect all the plates to Win the Game! •	16 Fun Bonus Dinner Plate Cards including prompts for naming category members. •	Draw Your Own Dinner Coloring page for Expressive Language Fun. •	Low Color/ B&W Version provided! See file labeled “Turkey Dinner Low Color Version” for those wishing to conserve printing resources. ❤ If you like this product, you may enjoy these fall activities: Just click the green text to see more. Click Here to become a follower. Voila! You will now receive customized email updates about this store.